Security forces opened fire and killed six people in Borena, south Ethiopia, while 20 others were seriously injured as anti-government protests that began yesterday in the Oromo region continued today in various towns across the region. Witnesses told ESAT that a convoy of soldiers heading to the Somali region was confronted by residents of Dire district in Borena who believed that the soldiers were carrying weapons that would be used to kill Oromos in the Somali region. As residents blocked the progress of the convoy, the soldiers opened fire and killed six people while 20 others were injured. Several roads in Yabelo, Moyale and other towns were blocked following the attack. The protest that began in the Oromo region yesterday continued in several towns in the region today. The towns of Wolliso, West Wollega, Gimbi, Kelem, Agarfa, Tulu Bolo and Sululta have seen massive protests. Protests also continued in Shashemene, where security forces shot and killed eight people on Wednesday. 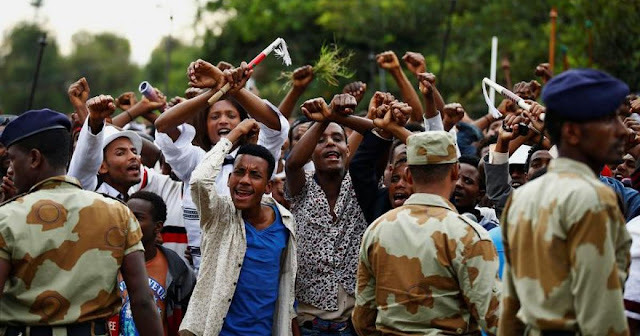 Protesters chanted slogans demanding the release of political prisoners and the removal of the TPLF regime, as the regional police force looked on. Some police officers were seen encouraging the crowd while others took pictures with protesters in a display of support and recognition to the protest. The new wave of protests which began yesterday is the first massive protest in the region after security forces killed hundreds of people in protests last summer in the Oromo and Amhara regions.